I’m not sure I’d even call this man a celebrity. If celebrities are A list, this guy is A*** list. Oh yes, this guy is pretty special. I could end this with just a few words and basically give away the answer, but as you should be aware by now – it’s never that easy. So here come the clues. First things first, this guy loves his Zune. He recently worked his arse off in one of the biggest campaigns America has seen in a long time. He’s also taken a lot of stick for doing what he believes in, as has some of his fellow supporters. He’s got two gorgeous little daughters who’ll be getting a new puppy in the New Year, a devoted wife and he’s won the hearts of many around the world. Got it yet? You should have done. Ok, a final clue – next year he is going to change the face of America as we know it. If you haven’t got it by now – where have you been? Look who it is, it’s George Bush’s successor – the soon to be new president of the United States of America, Mr Barack Obama (and probably the most tech savvy President ever). Ok, so it’s quite well known (or reported) that Barack Obama and his team are all about the Mac. This poses somewhat of a problem – Zunes don’t work on Macs, unless you go through the unnecessarily convoluted process of running Boot Camp or Parallels. So, either some porkies have been told or Obama has both a Mac and a PC which, let’s face it isn’t unlikely is it? I had him pegged as an iPod Touch user myself, but clearly his musical loyalties lie with Microsoft. 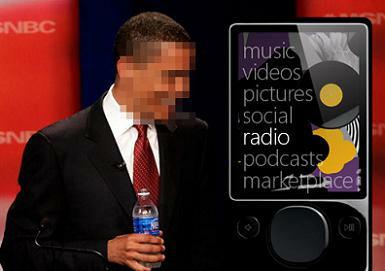 Apparently, the Zune is a firm favourite with the President elect, who takes it with him to accompany his gym workouts. I wonder what he listens to? Either way, this is great news for Microsoft – it’s just received the biggest endorsement possible.